For other uses, see Labyrinth (disambiguation). In Greek mythology, the Labyrinth (Ancient Greek: Λαβύρινθος labúrinthos) was an elaborate, confusing structure designed and built by the legendary artificer Daedalus for King Minos of Crete at Knossos. Its function was to hold the Minotaur, the monster eventually killed by the hero Theseus. Daedalus had so cunningly made the Labyrinth that he could barely escape it after he built it. 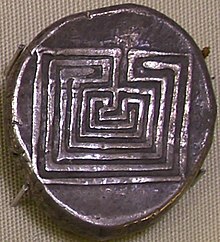 Although early Cretan coins occasionally exhibit branching (multicursal) patterns, the single-path (unicursal) seven-course "Classical" design without branching or dead ends became associated with the Labyrinth on coins as early as 430 BC, and similar non-branching patterns became widely used as visual representations of the Labyrinth – even though both logic and literary descriptions make it clear that the Minotaur was trapped in a complex branching maze. Even as the designs became more elaborate, visual depictions of the mythological Labyrinth from Roman times until the Renaissance are almost invariably unicursal. Branching mazes were reintroduced only when hedge mazes became popular during the Renaissance. In English, the term labyrinth is generally synonymous with maze. 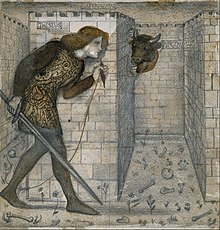 As a result of the long history of unicursal representation of the mythological Labyrinth, however, many contemporary scholars and enthusiasts observe a distinction between the two. In this specialized usage maze refers to a complex branching multicursal puzzle with choices of path and direction, while a unicursal labyrinth has only a single path to the center. A labyrinth in this sense has an unambiguous route to the center and back and presents no navigational challenge. Unicursal labyrinths appeared as designs on pottery or basketry, as body art, and in etchings on walls of caves or churches. The Romans created many primarily decorative unicursal designs on walls and floors in tile or mosaic. Many labyrinths set in floors or on the ground are large enough that the path can be walked. Unicursal patterns have been used historically both in group ritual and for private meditation, and are increasingly found for therapeutic use in hospitals and hospices. Beekes finds the relation with labrys speculative, and suggests instead the relation with lavra (λαύρα), narrow street. The original Minoan word appears to refer to labyrinthine grottoes, such as seen at Gortyn. Pliny the Elder's four examples of labyrinths are all complex underground structures, and this appears to have been the standard Classical understanding of the word. It is also possible that the word labyrinth is derived from the Egyptian loperohunt, meaning palace or temple by the lake. The Egyptian labyrinth near Lake Moeris is described by Herodotus and Strabo. By the 4th century BC, Greek vase painters also represented the Labyrinth by the familiar "Greek key" patterns of endlessly running meanders. When the Bronze Age site at Knossos was excavated by explorer Arthur Evans, the complexity of the architecture prompted him to suggest that the palace had been the Labyrinth of Daedalus. Evans found various bull motifs, including an image of a man leaping over the horns of a bull, as well as depictions of a labrys carved into the walls. On the strength of a passage in the Iliad, it has been suggested that the palace was the site of a dancing-ground made for Ariadne by the craftsman Daedalus, where young men and women, of the age of those sent to Crete as prey for the Minotaur, would dance together. By extension, in popular legend the palace is associated with the myth of the Minotaur. In the 2000s, archaeologists explored other potential sites of the labyrinth. Oxford University geographer Nicholas Howarth believes that 'Evans's hypothesis that the palace of Knossos is also the Labyrinth must be treated sceptically.' Howarth and his team conducted a search of an underground complex known as the Skotino cave but concluded that it was formed naturally. Another contender is a series of tunnels at Gortyn, accessed by a narrow crack but expanding into interlinking caverns. Unlike the Skotino cave, these caverns have smooth walls and columns, and appear to have been at least partially man-made. This site corresponds to an unusual labyrinth symbol on a 16th-century map of Crete contained in a book of maps in the library of Christ Church, Oxford. A map of the caves themselves was produced by the French in 1821. The site was also used by German soldiers to store ammunition during the Second World War. Howarth's investigation was shown on a documentary produced for the National Geographic Channel. It has twelve covered courts — six in a row facing north, six south — the gates of the one range exactly fronting the gates of the other. Inside, the building is of two storeys and contains three thousand rooms, of which half are underground, and the other half directly above them. I was taken through the rooms in the upper storey, so what I shall say of them is from my own observation, but the underground ones I can speak of only from report, because the Egyptians in charge refused to let me see them, as they contain the tombs of the kings who built the labyrinth, and also the tombs of the sacred crocodiles. The upper rooms, on the contrary, I did actually see, and it is hard to believe that they are the work of men; the baffling and intricate passages from room to room and from court to court were an endless wonder to me, as we passed from a courtyard into rooms, from rooms into galleries, from galleries into more rooms and thence into yet more courtyards. The roof of every chamber, courtyard, and gallery is, like the walls, of stone. The walls are covered with carved figures, and each court is exquisitely built of white marble and surrounded by a colonnade. During the 19th century, the remains of this structure were discovered by Flinders Petrie at the foot of the pyramid of Amenemhat III at Hawara in the Faiyum Oasis. The Classical accounts of various authors (Herodotus, Strabo, Pliny the Elder, among others) are not entirely consistent, perhaps due to degradation of the structure during Classical times. In origin, the structure was likely a collection of funerary temples such as are commonly found near Egyptian pyramids. In 1898, the Harpers Dictionary of Classical Antiquities described the structure as "the largest of all the temples of Egypt, the so-called Labyrinth, of which, however, only the foundation stones have been preserved." Herodotus' description of the Egyptian Labyrinth inspired some central scenes in Bolesław Prus' 1895 historical novel, Pharaoh. Pliny the Elder's Natural History (36.90) lists the legendary Smilis, reputed to be a contemporary of Daedalus, together with the historical mid-sixth-century BC architects and sculptors Rhoikos and Theodoros as two of the makers of the Lemnian labyrinth, which Andrew Stewart regards as "evidently a misunderstanding of the Samian temple's location en limnais ['in the marsh']." According to Pliny, the tomb of the great Etruscan general Lars Porsena contained an underground maze. Pliny's description of the exposed portion of the tomb is intractable; Pliny, it seems clear, had not observed this structure himself, but is quoting the historian and Roman antiquarian Varro. A design essentially identical to the 7-course "classical" pattern appeared in Native American culture, the Tohono O'odham people labyrinth which features I'itoi, the "Man in the Maze." The Tonoho O'odham pattern has two distinct differences from the classical: it is radial in design, and the entrance is at the top, where traditional labyrinths have the entrance at the bottom (see below). The earliest appearances cannot be dated securely; the oldest is commonly dated to the 17th century. A prehistoric petroglyph on a riverbank in Goa shows a maze-like pattern and has been dated to circa 2500 BC. [better source needed] Other examples have been found among cave art in northern India and on a dolmen shrine in the Nilgiri Mountains, but are difficult to date accurately. Early labyrinths in India typically follow the Classical pattern or a local variant of it; some have been described as plans of forts or cities. Labyrinths appear in Indian manuscripts and Tantric texts from the 17th century onward. They are often called "Chakravyuha" in reference to an impregnable battle formation described in the ancient Mahabharata epic. Lanka, the capital city of mythic Rāvana, is described as a labyrinth in the 1910 translation of Al-Beruni's India (c. 1030 AD) p. 306 (with a diagram on the following page). By the White Sea, notably on the Solovetsky Islands, there have been preserved more than 30 stone labyrinths. The most remarkable monument is the Stone labyrinths of Bolshoi Zayatsky Island - a group of 13–14 stone labyrinths on 0.4 km2 area of one small island. These labyrinths are thought to be 2,000–3,000 years old. The 7-course "Classical" or "Cretan" pattern known from Cretan coins (ca 400–200 BC) appears in several examples from antiquity, some perhaps as early as the late Stone Age or early Bronze Age. Roman floor mosaics typically unite four copies of the classical labyrinth (or a similar pattern) interlinked around the center, squared off as the medium requires, but still recognisable. An image of the Minotaur or an allusion to the legend of the Minotaur appears at the center of many of these mosaic labyrinths. The four-axis medieval patterns may have developed from the Roman model, but are more varied in how the four quadrants of the design are traced out. The Minotaur or other danger is retained in the center of several medieval examples. The Chartres pattern (named for its appearance in Chartres Cathedral) is the most common medieval design; it appears in manuscripts as early as the 9th century. "Classical" or "Cretan" design, well-known in antiquity. Roman mosaic picturing Theseus and the Minotaur. Rhaetia, Switzerland. Third century Roman mosaic labyrinth, Caerleon on Usk, Wales. Illustration of a labyrinth from La Nouvelle Maison rustique (1735). When the early humanist Benzo d'Alessandria visited Verona before 1310, he noted the "Laberinthum which is now called the Arena"; perhaps he was seeing the cubiculi beneath the arena's missing floor. The full flowering of the medieval labyrinth came about from the twelfth through fourteenth centuries with the grand pavement labyrinths of the gothic cathedrals, notably Chartres, Reims and Amiens in northern France. These labyrinths may have originated as symbolic allusion to the Holy City; and some modern thinkers have theorized that prayers and devotions may have accompanied the perambulation of their intricate paths. Although some books (in particular guidebooks) suggest that the mazes on cathedral floors served as substitutes for pilgrimage paths, the earliest attested use of the phrase "chemin de Jerusalem" (path to Jerusalem) dates to the late 18th century when it was used to describe mazes at Reims and Saint-Omer. The accompanying ritual, supposedly involving pilgrims following the maze on their knees while praying, may have been practiced at Chartres during the 17th century. However, no contemporary evidence supports the idea that labyrinths had such a purpose for early Christians. The cathedral labyrinths are thought to be the inspiration for the many turf mazes in the UK, such as survive at Wing, Hilton, Alkborough, and Saffron Walden. Over the same general period, some 500 or more non-ecclesiastical labyrinths were constructed in Scandinavia. These labyrinths, generally in coastal areas, are marked out with stones, most often in the simple 7- or 11-course classical forms. They often have names which translate as "Troy Town." They are thought to have been constructed by fishing communities: trapping malevolent trolls or winds in the labyrinth's coils might ensure a safe fishing expedition. There are also stone labyrinths on the Isles of Scilly, although none is known to date from before the nineteenth century. There are examples of labyrinths in many disparate cultures. The symbol has appeared in various forms and media (petroglyphs, classic-form, medieval-form, pavement, turf, and basketry) at some time throughout most parts of the world, from Native North and South America to Australia, Java, India, and Nepal. Labyrinth on floor of Grace Cathedral, San Francisco. In recent years, there has been a resurgence of interest in labyrinths and a revival in labyrinth building, of both unicursal and multicursal patterns. In modern imagery, the labyrinth of Daedalus is often represented by a multicursal maze, in which one may become lost. The Argentine writer Jorge Luis Borges was entranced with the idea of the labyrinth, and used it extensively in his short stories (such as "The House of Asterion" in The Aleph). His use of it has inspired other authors (e.g. Umberto Eco's The Name of the Rose, Mark Z. Danielewski's House of Leaves). Additionally, Roger Zelazny's fantasy series, The Chronicles of Amber, features a labyrinth, called "the Pattern," which grants those who walk it the power to move between parallel worlds. The avant-garde multi-screen film, In the Labyrinth, presents a search for meaning in a symbolic modern labyrinth. In Rick Riordan's series Percy Jackson & the Olympians, the events of the fourth novel The Battle of the Labyrinth predominantly take place within the labyrinth of Daedalus, which has followed the heart of the West to settle beneath the United States. Australian author Sara Douglass incorporated some labyrinthine ideas in her series The Troy Game, in which the Labyrinth on Crete is one of several in the ancient world, created with the cities as a source of magical power. Lawrence Durrell's The Dark Labyrinth depicts travelers trapped underground in Crete. A magical labyrinth, based on the original myth, appears in the third episode of The Librarians ("And The Horns of a Dilemma"). The labyrinth is also treated in contemporary fine arts. Examples include Piet Mondrian's Dam and Ocean (1915), Joan Miró's Labyrinth (1923), Pablo Picasso's Minotauromachia (1935), M. C. Escher's Relativity (1953), Friedensreich Hundertwasser's Labyrinth (1957), Jean Dubuffet's Logological Cabinet (1970), Richard Long's Connemara sculpture (1971), Joe Tilson's Earth Maze (1975), Richard Fleischner's Chain Link Maze (1978), István Orosz's Atlantis Anamorphosis (2000), Dmitry Rakov's Labyrinth (2003), and drawings by contemporary American artist Mo Morales employing what the artist calls "Labyrinthine projection." The Italian painter Davide Tonato has dedicated many of his artistic works to the labyrinth theme. Mark Wallinger has created a set of 270 enamel plaques of unicursal labyrinth designs, one for every tube station in the London Underground, to mark the 150th anniversary of the Underground. The plaques were installed over a 16-month period in 2013 and 2014, and each is numbered according to its position in the route taken by the contestants in the 2009 Guinness World Record Tube Challenge. Labyrinths and mazes have been embraced by the video game industry, and countless video games include such a feature. Prehistoric labyrinths may have served as traps for malevolent spirits or as paths for ritual dances. Many Roman and Christian labyrinths appear at the entrances of buildings, suggesting that they may have served a similar apotropaic purpose. In their cross-cultural study of signs and symbols, Patterns that Connect, Carl Schuster and Edmund Carpenter present various forms of the labyrinth and suggest various possible meanings, including not only a sacred path to the home of a sacred ancestor, but also, perhaps, a representation of the ancestor him/herself: . "..many [New World] Indians who make the labyrinth regard it as a sacred symbol, a beneficial ancestor, a deity. In this they may be preserving its original meaning: the ultimate ancestor, here evoked by two continuous lines joining its twelve primary joints." Schuster also observes the common theme of the labyrinth being a refuge for a trickster; in India, the demon Ravana has dominion over labyrinths, the trickster Djonaha lives in a labyrinth according to Sumatran Bataks, and Europeans say it is the home of a rogue. One can think of labyrinths as symbolic of pilgrimage; people can walk the path, ascending toward salvation or enlightenment. Author Ben Radford conducted an investigation into some of the claims of spiritual and healing effects of labyrinths, reporting on his findings in his book Mysterious New Mexico. Many labyrinths have been constructed recently in churches, hospitals, and parks. These are often used for contemplation; walking among the turnings, one loses track of direction and of the outside world, and thus quiets the mind. The Labyrinth Society provides a locator for modern labyrinths all over the world. Labyrinths have on various occasions been used in Christian tradition as a part of worship. The earliest known example is from a fourth-century pavement at the Basilica of St Reparatus, at Orleansville, Algeria, with the words "Sancta Eclesia" [sic] at the center, though it is unclear how it might have been used in worship. In medieval times, labyrinths began to appear on church walls and floors around 1000 C.E.. The most famous medieval labyrinth, with great influence on later practice, was created in Chartres Cathedral. The purpose of the labyrinths is not clear, though there are surviving descriptions of French clerics performing a ritual Easter dance along the path on Easter Sunday. Some books (guidebooks in particular) suggest that mazes on cathedral floors originated in the medieval period as alternatives to pilgrimage to the Holy Land, but the earliest attested use of the phrase "chemin de Jerusalem" (path to Jerusalem) dates to the late 18th century when it was used to describe mazes at Reims and Saint-Omer. The accompanying ritual, depicted in Romantic illustrations as involving pilgrims following the maze on their knees while praying, may have been practiced at Chartres during the 17th century. The use of labyrinths has recently been revived in some contexts of Christian worship. Many churches in Europe and North America have constructed permanent, typically unicursal, labyrinths, or employ temporary ones (e.g., painted on canvas or outlined with candles). For example, a labyrinth was set up on the floor of St Paul's Cathedral for a week in March 2000. Some conservative Christians disapprove of labyrinths, considering them pagan practices or "new age" fads. ^ Kern, Through the Labyrinth, 2000, item 43, p. 53. ^ Kern, Through the Labyrinth, 2000, item 50, p. 54. ^ Penelope Reed Doob, The Idea of the Labyrinth, pp. 40–41. ^ Kern, Through the Labyrinth, p. 23. ^ The usage restricting maze to patterns that involve choices of path is mentioned by Matthews (p. 2–3) as early as 1922, though he does not find the distinction useful and does not follow it himself. ^ Jeff Saward. "Mazes or Labyrinths?" (PDF). Labyrinthos. Retrieved 28 Dec 2017. ^ "About Labyrinths". The Labyrinth Society. Retrieved 18 Sep 2015. ^ Raymoure, K.A. "da-pu2-ri-to-jo". Minoan Linear A & Mycenaean Linear B. Deaditerranean. ^ Mayer, "Maximilian (1892). "Mykenische Beiträge. II. Zur mykenischen Tracht und Kultur". Jahrbuch des Kaiserlich deutschen archäologischen Instituts. VII: 191. ^ Λυδοὶ γάρ ‘λάβρυν’ τὸν πέλεκυν ὀνομάζουσι, Plutarch, Greek Questions, 45 2.302a. ^ Rouse, W. H. D. (1901). "The Double Axe and the Labyrinth". Journal of Hellenic Studies. 21: 268–274. Rouse criticised the association, noting the reappearance of the same inscribed symbols at the newly discovered palace at Phaistos (p. 273). ^ Sarullo, Giulia (2008). "The Cretan Labyrinth: Palace or Cave?". Caerdroia. 37: 31–40. ^ Kern, Hermann (2000). "Chapter III: Ancient "Labyrinths"". Through the Labyrinth. Munich, New York, London: Prestel. pp. 57–65. ISBN 3791321447. ^ Kern, Hermann (2000). "Chapter II: The Cretan Labyrinth". Through the Labyrinth. Munich, New York, London: Prestel. pp. 41–55. ISBN 3791321447. See also Figure 3, p. 34. ^ Homer. "Iliad". Perseus Digital Library. Tufts University. xviii.590-3. ^ Miller, Paul Allen (July 1995). "The Minotaur Within: Fire, the Labyrinth, and Strategies of Containment in Aeneid 5 and 6". Classical Philology. 90 (3): 225–240. ^ "Furthermore he wrought a green, like that which Daedalus once made in Cnossus for lovely Ariadne. Hereon there danced youths and maidens whom all would woo, with their hands on one another's wrists. The maidens wore robes of light linen, and the youths well woven shirts that were slightly oiled. There was a bard also to sing to them and play his lyre, while two tumblers went about performing in the midst of them when the man struck up with his tune." ^ a b Steve Connor (16 October 2009). "Has the original Labyrinth been found?". The Independent. ^ Herodotus, The Histories, translated by Aubrey de Sélincourt, Book II, pp. 160–61. ^ Kern 2000, p. 59. ^ Peck, Harry Thurston (chief editor). "Hieratic Papyrus. (Twentieth Dynasty.)" in the Harpers Dictionary of Classical Antiquities, published 1898, page 29. ^ Andrew Stewart, One Hundred Greek Sculptors: Their Careers and Extant Works, "Smilis." ^ Saward, Jeff (2003). Labyrinths and Mazes. Gaia. p. 70. ISBN 1579905390. ^ "Festival on Labyrinth and Symmetry". 9th ISIS Congress. 9 September 2013. ^ Saward, Labyrinths and Mazes, p. 60–61. ^ "quod nunc Harena dicitur": Roberto Weiss, The Renaissance Discovery of Classical Antiquity 1969:25. Herbermann, Charles, ed. (1913). "Labyrinth" . Catholic Encyclopedia. New York: Robert Appleton Company. ^ a b c d Wright, Craig M. (2001). The maze and the warrior: symbols in architecture, theology, and music. Harvard University Press. p. 210. ISBN 978-0-674-00503-7. ^ Russell, W. M. S.; Claire Russell (1991). "English Turf Mazes, Troy, and the Labyrinth". Folklore. Taylor and Francis. 102 (1): 77–88. doi:10.1080/0015587x.1991.9715807. JSTOR 1260358. ^ Saward, Jeff (2003). "Chapter 6: The Modern Revival". Labyrinths and Mazes. Gaia. pp. 179–208. ISBN 1579905390. ^ Brown, Mark (7 February 2013). "Tube celebrates 150th birthday with labyrinth art project". The Guardian. Retrieved 9 February 2013. ^ Wallinger, Mark (2014). Labyrinth: A Journey Through London's Underground. Art Books. ISBN 9781908970169. Retrieved 7 January 2017. ^ Ruth Mellinkoff, Averting Demons, 2004, Vol. 2, p. 164. ^ a b Schuster, Carl, & Edmund Carpenter (1996). Patterns that Connect: Social Symbolism in Ancient & Tribal Art. Harry N. Abrams. p. 307. ISBN 978-0-8109-6326-9. ^ Radford, Ben (2014). "Chapter 10 Labyrinths: Sacred Symbols in the Sand". Mysterious New Mexico. Albuquerque, NM: University of New Mexico Press. pp. 207–224. ISBN 978-0-8263-5450-1. ^ a b Kern, Hermann (2000). "VIII. Church Labyrinths". Through the Labyrinth: Designs and Meaning Over 5,000 Years. Prestel. ISBN 978-3-7913-2144-8. ^ Ian Tarrant and Sally Dakin, Labyrinths and Prayer Stations, p 6. ^ Mark Tooley (September 2000). "Maze Craze". Touchstone Magazine. The Fellowship of St. James. Retrieved December 29, 2016. Lauren Artress, Walking a Sacred Path: Rediscovering the Labyrinth as a Spiritual Practice, Penguin Books, 1995, ISBN 1-57322-007-8. Lauren Artress, The Sacred Path Companion: A Guide to Walking the Labyrinth to Heal and Transform, Penguin Books, 2006, ISBN 1-59448-182-2. Doob, Penelope Reed (1992). The Idea of the Labyrinth: from Classical Antiquity through the Middle Ages. Ithaca: Cornell University Press. ISBN 0-80142-393-7. Karl Kerenyi, Dionysos: Archetypal Image of Indestructible Life, Princeton University Press, 1976. Henning Eichberg, "Racing in the labyrinth? About some inner contradictions of running." In: Athletics, Society & Identity. Imeros, Journal for Culture and Technology, 5 (2005): 1. Athen: Foundation of the Hellenic World, 169-192. Carl Schuster and Edmund Carpenter, Patterns that Connect: Social Symbolism in Ancient & Tribal Art, Harry N. Abrams, NY, 1996. Wikimedia Commons has media related to Labyrinth. Wikisource has the text of the 1911 Encyclopædia Britannica article Labyrinth. Saward, Jeff (2012). "Labyrinthos". Labyrinthos.net. Veriditas – Spiritual labyrinth organization founded by Lauren Artress. Astrolog.org, Maze classification, Extensive classification of labyrinths and algorithms to solve them. Begehbare-labyrinthe.de Website (in German) with diagrams and photos of virtually all the public labyrinths in Germany. Mymaze.de, German website (in German) and Mymaze.de (in English) with descriptions, animations, links, and especially photos of (mostly European) labyrinths. Indigogroup.co.uk, British turf labyrinths by Marilyn Clark. Photos and descriptions of the surviving historical turf mazes in Britain. Gwydir.demon.co.uk, Jo Edkins's Maze Page, an early website providing a clear overview of the territory and suggestions for further study. Gottesformel.ch, "Die Kretische Labyrinth-Höhle" by Thomas M. Waldmann, rev. 2009 (in German) (in English) (in French) (in Greek). Description of a labyrinthine artificial cave system near Gortyn, Crete, widely considered the original labyrinth on Crete. Sanu.ac.rs, "The Geometry of History," Tessa Morrison, University of Newcastle, Australia. An attempt to extend Phillips's topological classification to more general unicursal labyrinths. Labyrinth of Egypt – Archaeological site reconstruction and 3D diagrams based on the writings of Herodotus and Strabo. Report of expedition to Hawara in 2008 in search of the lost Egyptian Labyrinth of Herodotus.